filmed specifically for this fourth edition of Vis-a -vis, builds on the stories of each character while serving to support and expand upon the linguistic and cultural content of the chapter as a whole. The Bienvenue dans le monde francophone feature that recurs after every four chapters in the textbook has been broadened to include Louisiana, Morocco, Switzerland, and Tahiti. Minor changes have been made to the scope and sequence. The overall goal of the revision remains the same as that of the third edition: to promote a balanced four-skills approach to learning French through a wide variety of listening, speaking, reading, and writing activities, while introducing students to the richness and diversity of the Francophone world. A beautiful new contemporary design gives Vis-a -vis an appealing look, inspired by real-life personal blogs that are unique and visually stunning. Hatier, Magnard, and Bordas, and she is currently working on a project for Hachette. She is the author of the McGraw-Hill French reader C’est la vie! and has written for successive editions of Vis-ï¿½-vis. She lives in Paris and New York. 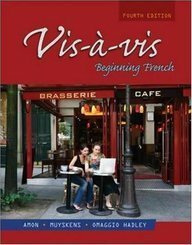 coauthor of several other French textbooks, including Rendez-vous: An Invitation to French and ï¿½ vous d'ï¿½crire.